Whyteleafe and VCD both needed points to maintain their challenges for play off places and ended up sharing the points in a lively nil nil draw full of incidents. Leafe had to make some changes following the transfer of leading scorer Eddie DSane to Malden and Tiptree. The first half was quiet with few chances. Harrison Carnegie came close when his 15th minute cross from the right took a deflection and went just past the far post for a corner. Leafe then hit the woodwork in the 22nd minute, Lauris Chin found Marvin Armstrong on the edge of the box and his shot cleared keeper Joe Mant and clipped the bar. At the other end, VCD danger man, free scoring Charlie McDonald was through in the 35th minute but Tyler McCarthy was quickly out to make a save with his feet to block the goal bound shot. The hosts were unlucky seven minutes later when Courtney Barrington's fine shot from outside the box hit the foot of the post and bounced away to safety. Leafe had a couple of late chances in the half. Carnegie shot over from a Bradley Wilson free kick, then a minute from the break, Armstrong was presented with the ball on the edge of the box from a poor clearance but shot wide. The second half was a much livelier affair. Matt O'Donoghue had a great half and most of Leafe's chances came from his runs and crosses down the right. McCarthy also shone for Leafe with a series of good saves, the first coming in the 49th minute when he blocked a shot from Ricardo Joseph from close range. Following one of O'Donoghues overlapping run and crosses in the 57th minute, Armstrong played a neat one two with Chin but shot wide. Chin then had a shot blocked after receiving the ball in a good position from Carnegie. Whyteleafe fans will remember Callum Adonis-Taylor on loan from Tonbridge Angels. This was his first appearance for VCD on loan from the same club, but it was not what the hosts would have been looking for. Having been booked already for a bad challenge, he brought down Armstrong with another clumsy challenge in the 64th minute and was then shown a second yellow, and red card. Leafe should have taken the lead from the resultant free kick. Wilson picked out Brian Akongo, who had come on for Arif Hattabi, only a couple of yards in front of goal, but he somehow managed to head the ball down into the ground, and it bounced over the bar. Akongo's misery was complete in the 73rd minute when following a dangerous tackle he was shown a straight red card after only 20 minutes on the pitch. Both sides were now reduced to 10 men, making a bit more space and both sides continued to look for a winner. Leafe brought on Scott Day and Simon Offei to bolster their attack, the hosts also made all 3 of their substitutions. McCarthy made a number of good saves, including a block from Malachi Hudson who was through in the 74th minute, and another good save a minute later, tipping a goal bound shot around the post. 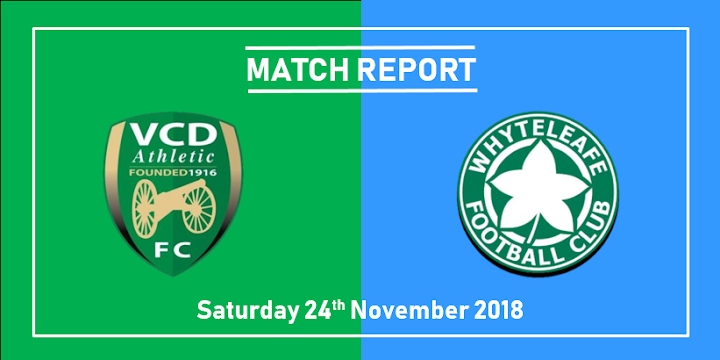 The hosts finished the stronger but could not beat the in form McCarthy who was called upon again in stoppage time to save from Hudson to secure a point and end Leafe's losing run. Leafe now have 2 difficult home games and will be hoping to repeat their performance against Hastings in the FA Trophy when they meet again on Tuesday to maintain their push for a play-off place. Whyteleafe Team: McCarthy, O'Donoghue, Wilson (Day 64), Campbell, Thompson, Holder, Carnegie, Graham, Chin (Offei 83), Armstrong, Attabi (Akongo 54). Subs not used Orome, Aziz.